A type of unsalted yeast starter used in Italy to bake the traditional country breads, also known as artisan breads, that have a crunchy outer crust covering a chewy inner crumb, such as Francese, Pugliese or Ciabatta breads. The qualities provided by this starter for bread include a moist texture, a depth of flavor and a wonderful aroma. Unlike some bread starters, such as sourdough, that are kept going for long periods to provide a constant source of leavening for bread dough, a biga starter is made fresh each time the bread is made. 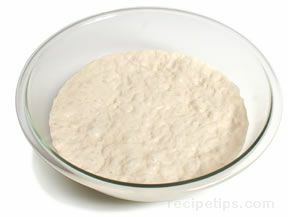 A typical biga starter can be made by mixing ¼ ounce fresh yeast with ¼ cup warm water (95º to 115ºF). The yeast mixture is allowed to sit for a few minutes. In a large bowl, add 3 cups of flour and form a well in the center. Add the yeast mixture to the well and begin pushing the flour into the well. Add enough water (up to another ¾ cup) to create a dough that is firm, but not too dry. Transfer the dough onto a floured work surface and knead the dough for several minutes to form an elastic and firm ball of dough. Place the ball of dough into a bowl, cover with oiled plastic wrap, and allow it to rest in a warm location for 12 to 16 hours. When the biga has risen and then begins to fall back on itself, it is ready to use. There are many versions of biga starter and the procedure and ingredient quantities will change according to the bread recipe. Biga starter can also be frozen to extend the life, but should be used within several weeks.